This page on Electric Field Measurement vs Magnetic Field Measurement describes Electric Field Measurement and Magnetic Field Measurement methods and equipments.It mentions EM radiation and mentions usefulness of performing radiation measurements. As we know Electromagnetic (EM) waves are used to carry information from source to the destination. The information can be voice or data or image. EM waves travel at the speed of light which is 3x108 m/s. 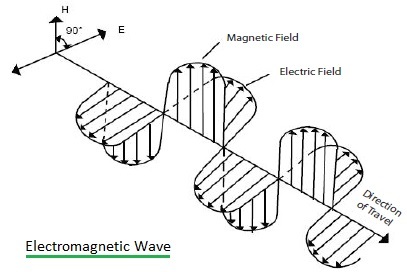 As shown in the figure-1 EM wave consists of two components electric field and magnetic field. As shown E-field and H-field are perpendicular to each other as well as perpendicular to the direction of propagation. EM field is measured as power per unit area known as power density. The unit of measurements are W/m2 or mW/cm2 or µW/cm2. As shown in the figure-2 EM waves are of different types having different frequency ranges and energy levels. EM radiation is categorized into ionizing radiation and non-ionizing radiation. Ionizing type has higher energy compare to non-ionizing type. In this page we will see radition due to mobile phones and cellular towers. The EM waves used for such applications are known as RF (Radio Frequency) Waves. RF frequency used for these applications fall around 500MHz to 2500 MHz. The other bands used for wireless applications in the households include 3.5 GHz or 5 GHz. The typical standards are WLAN, Zigbee, bluetooth, HomeRF etc. How Radiation Measurements are useful? Output power from mobile phones and Base Stations should be in range specified by Cellular system and RF interference experts. Following are the reasons of performing radiation measurement. ➨ It will help identify locations having high radiation and hence one can decide where to keep living room or bed room as RF energy can severely affect human body due to its absorption characteristics. ➨ It will help in cellular installations i.e. where to keep base stations in the cellular system. ➨ It will help in powerline, transformers and other cable installations. ➨ It will help in installation of AP of WLAN standard or other wireless technologies. ➨ It will help in identifying possible radiation sources in the area and hence will help remove them or replace with good one or reduce its affect using proper shielding material. Electric field strength is measured in units of Volts per meter (V/m). Electric field meters or EMF meters are used for electric field measurement in V/m or body voltage in milli-Volts. Electric fields are present outside and inside the buildings. They are present outside of the buildings due to high tension cables which usually are grounded . They are present inside the buildings due to wall cables and other home appliances using electric lines. The Electric field measurements are necessary as it helps one know presence of low frequency and high frequency electric fields which are harmful for humans. Magnetic field strength is measured in units of amperes per meter (A/m). It is also measured in Tesla (T) or milli Tesla (mT) or nT (nano Tesla) or mG (milliGauss). Magnetic fields are present mostly in dense populated areas where low power cables are used abundantly. They affect human beings as they penetrate through the buildings and other structures. Magnetometer is used for low magnetic field measurements of value less than 1mT. Gaussmeter is used for high magnetic field measurements of value greater than 1mT. It is very important to perform magnetic field measurement as it is very costly and difficult task to mitigate or reduce magnetic field interference.